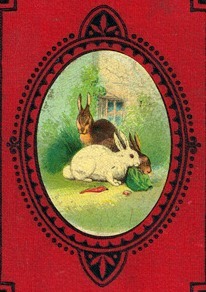 Lovely, public domain, vintage rabbit cover art. Three bunnies enjoy a bit of lettuce and carrots. They are surrounded by a decorative medallion on a red background. This rabbit drawing appeared on Little Alice’s Palace published by Thomas Nelson and Sons in 1880.